Big round number alert! THE AFRICAN QUEEN marks movie ranking number 800 for johnlinkmovies! When I hit one of these numbers (or at least when I actually notice I’m about to hit one), I try and watch something I think will be good. And while I have seen a large percentage of the Humphrey Bogart catalogue, THE AFRICAN QUEEN is one of the biggies that I had yet to get to. 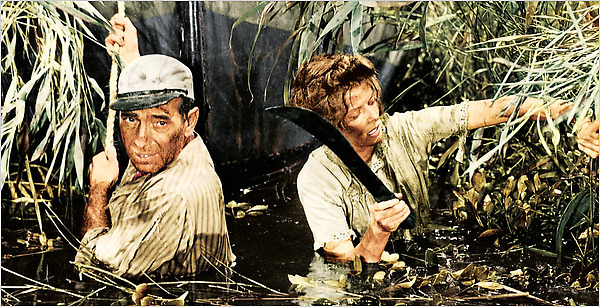 I watched THE AFRICAN QUEEN (1951) on 1.25.15. It was my first viewing of the film. The first fifteen minutes, give or take, are no indication of where this movie will go. World War I has just broken out and the Germans are working through Africa. That fact is not known by brother and sister Reverend Samuel Sayer and Rose Sayer (Robert Morley and Katharine Hepburn). Their biggest worry is that the Captain of the boat which delivers their mail, Charlie Allnut (Humphrey Bogart) has too much gas at the dinner table. Their African village is quaint, with folks who earnestly go to church even if they can’t sing the hymns. Soon, though, the Germans raid the village. They burn the homes and take away the villagers. Samuel and Rose are left alone. Samuel goes crazy and dies. That day, Charlie shows up and agrees to take Rose out on his boat, the African Queen. Up to that point in the film, the story isn’t particularly engaging. The dinner table gastrointestinal episode feels forced, Rose is not likable, Charlie seems dull (which is odd for a Bogart character since Bogie usually played the smartest guy in the room), and the acting from Robery Morley is over-exaggerated. Director John Huston rarely has misfires, but the first act of this film (which is mercifully short) is a misfire. But, then, some magic happens. 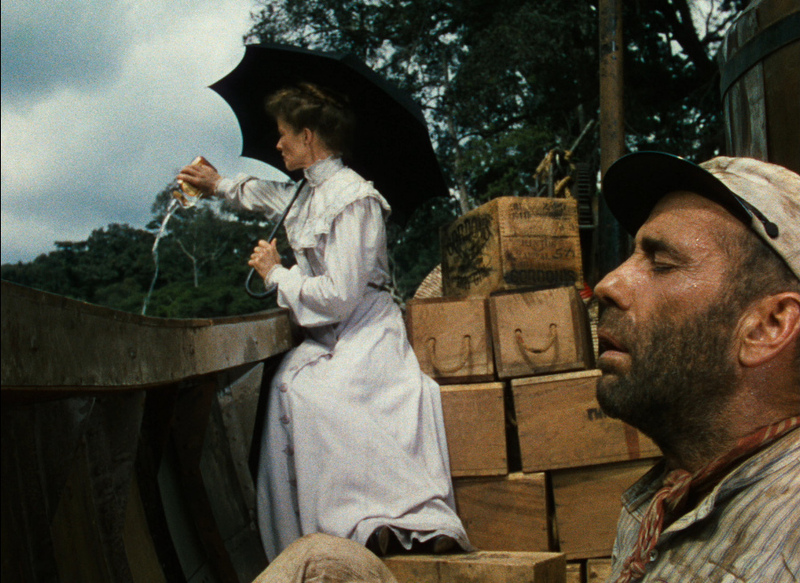 Most of the rest of this movie has Charlie and Rose alone on the African Queen. They are at odds from the start. Charlie is a simple man, though not stupid. Life is as easy as steering his boat up and down the river and being his own boss. He has a broken engine which he does not fix because kicking it until it works gives him a sense of power. Rose is modest and proper. Charlie’s bottles of gin offend her. She is not mean, but she has a stick lodged deeply into her posterior. THE AFRICAN QUEEN needs a central conflict, so Rose convinces Charlie to try and maneuver into a lake to blow up a German ship which keeps the good guys out. Charlie agrees, thinking his boat either won’t make it or that she will give up on the quest due to fear. The moment when they first rush through some rapids is where Charlie thinks she will break. Instead she surprisingly becomes more invigorated. In the days after, Charlie both accepts that she won’t be moved and that he is in love with her. The chemistry between Bogart and Hepburn is spectacular. Their relationship is not easy. This isn’t one of those Bogart noir films where women love him and he pretends not to care. In THE AFRICAN QUEEN these two people are first indifferent towards each other, then they dislike each other, and then they fall in love with each other. When they have their one fight from that point it is clear that the fight is out of fear of losing one another. In just over one and a half hours of film time we see a complete transformation in their characters. This is one of Bogart’s finest roles. He is not the man of power and brains he usually portrays. He is uneasy on land and comfortable on sea (as long as there are no leeches stuck to him). He knows what he knows and doesn’t worry about what society might think of his life of drifting. Bogart often played the homeless drifter, CASABLANCA being the most obvious example, but never has he been so vulnerable. The cinematography, too, is wondrous. We are regularly shown the wild of Africa as a dangerous place just waiting upon the coast. The boat is the safest place in the world for these two. It is where they can’t be shot, it is where they are not being hunted by crocodiles or snacked on by leeches, and it is where their love is born and where it grows and where it is consummated. What starts as a less than stellar movie becomes a classic, slowly and surely. The movie leans heavily on the two leads who prove more than able to handle the weight. Perhaps this isn’t the most entertaining film of the 50s, the most powerful, or the most epic. But it is harder to think of a movie with two better central characters. The bonus is for the cinematography. Beautiful throughout. ~ by johnlink00 on January 26, 2015. haha!! I liked this movie!! Yeah man! It’s good, right?! I thought it was a lot of fun! When I reviewed it for Cara’s site I totally forgot to mention that scene at the dinner table where Bogart’s stomach keeps growling. I thought that was pretty classic! Haha, well good. I thought it was just weird. But the movie in general… I totally dug. Have you seen Maltese Falcon? You would love Bogart in that. I haven’t – that was my first ever Bogart film – I’ll queue it up, though! Couldn’t agree more. Great review.